Venture into the heart of Honey Island Swamp, considered one of the wildest swamps in America. This 2-hour privately narrated nature tour with a professional wetland ecologist takes you aboard a shaded flat-bottom boat, custom-built to accommodate up to 14 passengers. Departing from the West Pearl River in Slidell, your guide points out mossy cypress trees and plenty of Cajun critters in the wildlife preserve. Round-trip transport is provided from your New Orleans hotel. Start your tour with private hotel pickup in the French Quarter or downtown New Orleans. Your driver provides insightful commentary on the city and shares firsthand experiences of Hurricane Katrina and its aftermath during the 45- to 60-minute drive to the West Pearl River in Slidell. Upon arrival, hop aboard the 14-passenger US Coast Guard–approved vessel, which provides plenty of shade from the Louisiana sun. You and your party will embark on an interactive 2-hour boat tour of Honey Island Swamp, which boasts nearly 70,000 acres (28,327 hectares) of protected wildlife preserve. This private tour for family and friends allows you to spend as much time in one area as your group desires. See the lovely sight of moss hanging from the gnarled cypress trees and take in the sweet smell of wild azaleas. 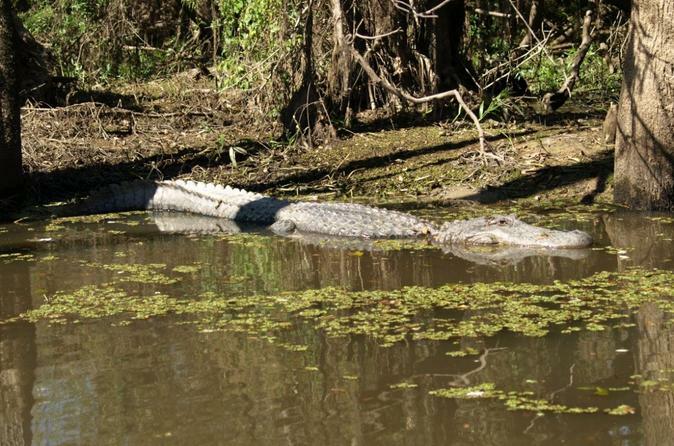 Listen to your captain’s swamp tales of pirates, Bigfoot sightings and prehistoric creatures, and keep your eyes peeled for alligators, herons, egrets, deer, feral hogs, nutria, raccoons, otters, turtles and frogs along the riverbanks and lurking in the murky waters below. Also be on the lookout for bald eagles, owls, osprey and other water fowl soaring through the sky. Passing through a Cajun village where local fisherman reside, you may observe them catching bluegill, sunfish, largemouth bass, alligator gar, flathead catfish, freshwater drum and buffalo fish in addition to thousands of pounds of crawfish caught in these waters each season. During your journey back up river, learn more about the wetland ecology from live narration on board. Afterward, you’re transferred back to your hotel in New Orleans.